Unlike most young people, when asked what he wanted to be when he grew up, Pranjal Nautiyal had an unwavering answer – he wanted to be an engineer. Pranjal was surrounded by engineers all of his life while living in New Delhi, where he was born and raised; his father and cousin both pursued careers in STEM. In middle school, Pranjal found inspiration in India’s 11th President, Dr. A. P. J. Abdul Kalam, also known as “the rocket man.” Kalam’s leading role in the development of India’s missile and nuclear weapons programs and his book, Wings of Fire, ultimately solidified Pranjal’s aspirations to pursue his calling for engineering. During his undergraduate studies, Pranjal sought out research opportunities which led to several published papers and ultimately a better sense of what his graduate career would entail. Rather than taking the conventional route of first completing a master’s, he decided instead to embark on pursuing his Ph.D.
Today, Pranjal is a rising star in the Department of Mechanical and Materials Engineering (MME) where he has received various accolades for his achievements and contributions to his field. While beginning his FIU journey as a Ph.D. student in fall 2015, he was awarded the Presidential Fellowship Award, which funded the first three years of his materials science and engineering Ph.D. in the College of Engineering & Computing. Since then, Pranjal has been making major strides towards his goal of developing new technologies with diverse scientific applications. The modest Pranjal remarked, “This has been a good month for me,” seemingly downplaying his latest successes. He was awarded the Defense Innovation Award for 2018, as well as the 2019 American Institute of Mining, Metallurgical, and Petroleum Engineers (AIME) Henry DeWitt Smith Scholarship. Pranjal also placed in the top 10 for the Graduate Excellence in Materials Science (GEMS) Award. He received the Defense Innovation Award for his project on Boron Nitride Nanotube Based Advanced Metal Matrix Nanocomposites for Aerospace Applications. This project deals with advanced composites with excellent strength and high-temperature properties. Its purpose is to augment the performance of lightweight metals such as aluminum, and magnesium, by using advanced nanomaterials. 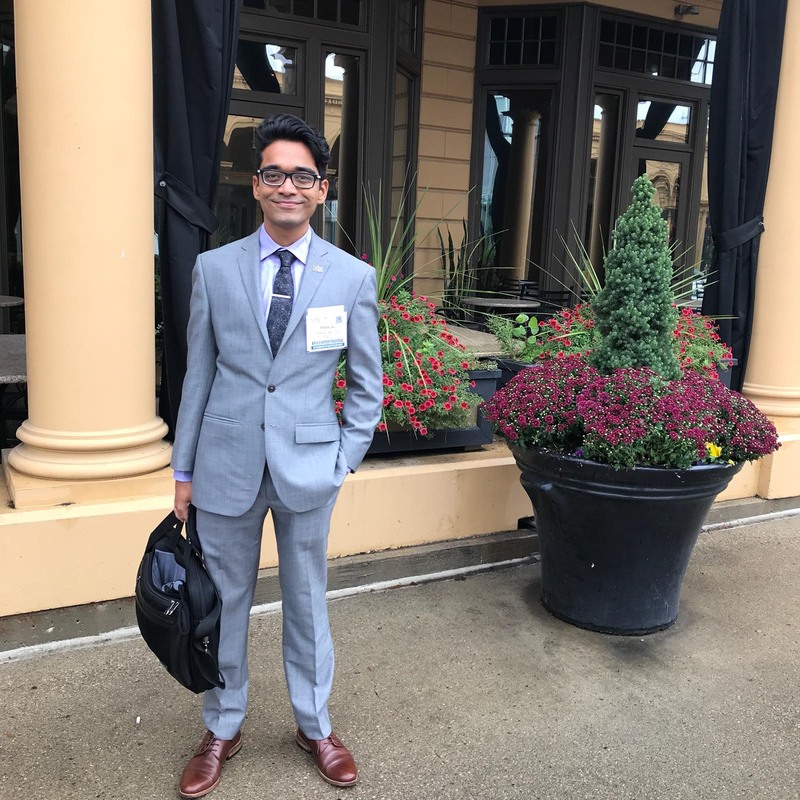 Pranjal’s lightweight composite technology was selected as one of the top 15 percent submissions and he traveled to Tampa in October to the summit, where he presented. Pranjal thanks his mentors, Arvind Agarwal, and Benjamin Boesl, for their tremendous help and guidance throughout their project together. As the recipient of the 2019 AIME Henry DeWitt Smith Scholarship and first place winner for the TMS Best Paper Contest, Pranjal is being awarded $2,000 and travel assistance to attend the TMS 2019 conference in San Antonio, Texas, where he will receive his awards in March 2019. Earlier this summer, Pranjal also applied for the GEMS award. He was listed as one of the top 10 applicants, based on his outstanding credentials and research work. He attended the MS&T meeting in Columbus, Ohio, this fall where he delivered a research presentation as a GEMS finalist. His success is marked by a sustained interest in engineering, determination and academic excellence. As Pranjal looks back at his life, he credits various experiences outside the classroom and the lab for opening various doors that led to his success. He found a sense of comfort in the diversity that comprises the “international” facet of FIU. Whether it was adjusting to the Miami lifestyle or his Ph.D. coursework, the commitment of FIU faculty to their students played in an integral role in his development as a graduate student. His mentor, Arvind Agarwal, professor and the chairman of the Mechanical and Materials Engineering Department, served as a direct advisor during his undergraduate senior year project in India and ultimately inspired him to pursue his Ph.D. Although he continues to diligently work in the Plasma Forming Laboratory and the Nanomechanics and Nanotribology Laboratory at the AMERI, in the near future, Pranjal envisions himself working in academia in the area of research and teaching, and potentially starting his own business at some point.